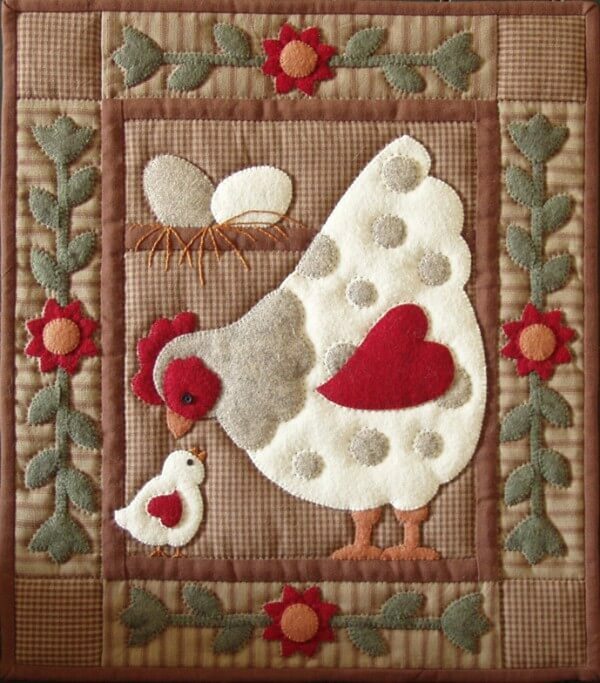 A plump and plucky polka dot hen presides lovingly over her new chick. Two more still unhatched eggs rest in an overhead perch. All are nestled inside a floral/leaf border. Finished size is 13in x 15in. Colors are cream, cobblestone, brown, red, green and gold. Kit includes all wool felt for appliqu�, all fabrics (100% cotton) for background, borders, back, and binding, batting, buttons for eyes, embroidery floss, precise patterns and complete instructions.